Each training zone represents a different level of effort, ranging from easy to hard. An overwhelming amount of information is available on training zones. Different coaches and books use different nomenclature, and this can make it confusing. This book is designed to give you a solid foundation in the world of training; the goal is to simplify things so that you’ll have a good understanding that’s adaptable to whatever terminology you encounter along the way. Let’s break intensity down into its simplest components. At the most basic level, you have to ask yourself a simple question before you head out on a training ride: “Is this workout easy or hard?” Is your bike rolling down the street with little effort, or are you about ready to blow a gasket? Easy or hard. It’s that simple. To focus on particular components of your physiology and to keep your workouts interesting, I further divide “easy” and “hard” into three different levels of workout intensity (figure 4.1). 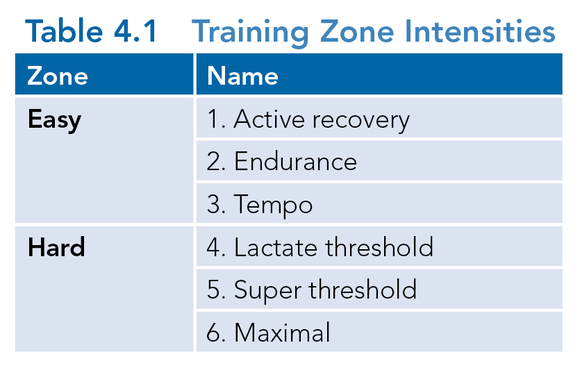 That gives you a total of six separate training zones (table 4.1). This is the easiest zone. It is intended to help you recover from difficult training rides. For example, you may train in this zone if you feel thrashed because you did multiple, high-end intervals the day before. An easy spin—while outside breathing the fresh air—can help you loosen and relieve tired muscles. The focus is to help your legs rejuvenate, and even though the training in this zone is easy, it’s an important part of your overall training program. Functionally, endurance work encompasses everything below your LT. The primary difference between recovery and endurance is the duration. On endurance rides, you will generally go longer and farther than a simple recovery ride. In the endurance zone, you should focus on laying the groundwork of your physiology so that you have a strong platform for your future training. All the blood vessels, capillaries, cells, and mitochondria need to be present before, as they say in the movie This is Spinal Tap, you “put it up to 11.” Like any structure, your body is only as strong as its foundation, and that’s what this training zone is all about. Early in the season, you’ll spend a lot of time in this zone, but throughout the entire program, you should continually revisit your base conditioning. A ride in the tempo zone is very much like an endurance ride, but with slightly more serious speed. You may stop to smell the roses on an endurance ride, but on a tempo ride, you need to be a little more focused and disciplined. This ride mimics a long effort, but it is done at an easier pace than when you’re in a race or trying to obtain a personal goal performance. Focus on a rhythmic pattern, ticking away at the pedals and eating through the miles as you build up a solid physiologic foundation. In this zone, you really hone in on trying to increase your LT. This is all about training your body to tolerate higher and higher intensities for longer periods of time. The less lactic acid you produce, the better you’ll go on the road. You want your threshold percentage to be as high as possible. The purpose of this zone is to make your body efficient at using the available energy supply and enhancing the removal of cellular waste from exercise. It is a difficult training zone because it involves a hard effort that often lasts for an extended period of time. But once you start completing training cycles in this zone, you’ll note the increased performance on the road. Fitness is a good feeling! This is pure suffering. You will be counting the seconds (that seem like minutes) when doing intervals in zone 5. This intensity has you working above your LT. Your body is making the products of anaerobic metabolism faster than they can be cleared. You’ll feel the burn building up right away. Zone 5 trains your maximal capacity and helps lift your V?O2max. This intensity hurts, but the good news is that zone 5 intervals aren’t nearly as long as zone 4; therefore, you can keep your mind focused on finishing the interval. This is maximal effort. You’ll be working in zone 6 when you sprint for the line or a hilltop finish. By definition, this intensity can only be maintained for short bursts. This is top-end output. Zone 6 training not only helps increase your performance ceiling, but it also helps you become “comfortable” at your high end. That might seem impossible, but you want to ensure that you don’t go all spastic or lose form when you are sprinting for the line. Neuro-coordination goes out the window when you become very fatigued, and training in zone 5 and zone 6 will improve your ability to continue pedaling efficiently right when you need it most. 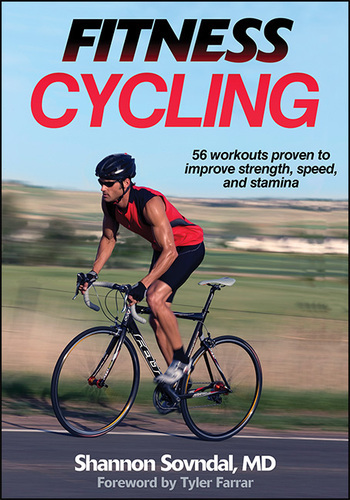 This excerpt is from the book, Fitness Cycling . It’s published with permission of Human Kinetics. Please purchase this book from Human Kinetics.